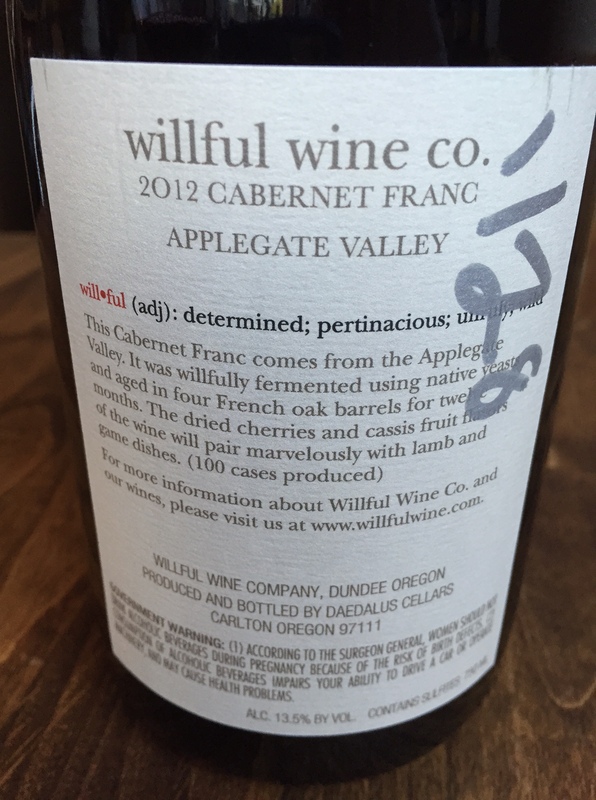 Thirty Oregon Wines in Thirty Days, days 27 & 28: Field Trip to Portland! | the wine snob. Thirty Oregon Wines in Thirty Days, days 27 & 28: Field Trip to Portland! 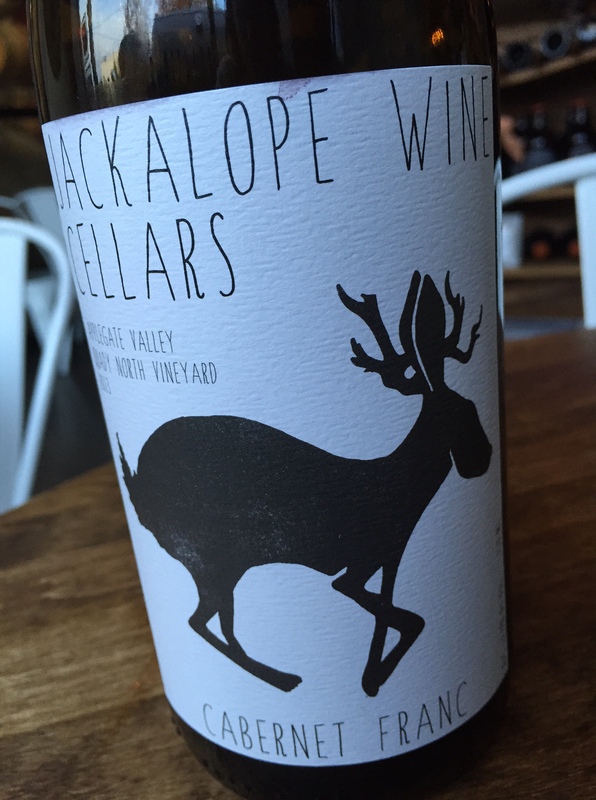 Yesterday I field-tripped up to Portland and paid a visit to the SE Wine Collective! I mean, it WAS Wednesday after all. What better day to have an extended happy hour? Its been unbelievably foggy in the Valley all week, but as soon as I got closer to Portland, the sun was out and it an absolutely gorgeous afternoon. Happy, I was. The SE Wine Collective was the site of a killer dinner that I went to back in December. I hadn’t been back since, and was excited to explore a few reds in particular. It was really convenient to be able to sample two Cab Francs from Southern Oregon in one place, by the glass/taste. Can any other place really say that? Not sure, but in any case- its darn awesome. Lets dive in. Its Cab Franc time, baby. 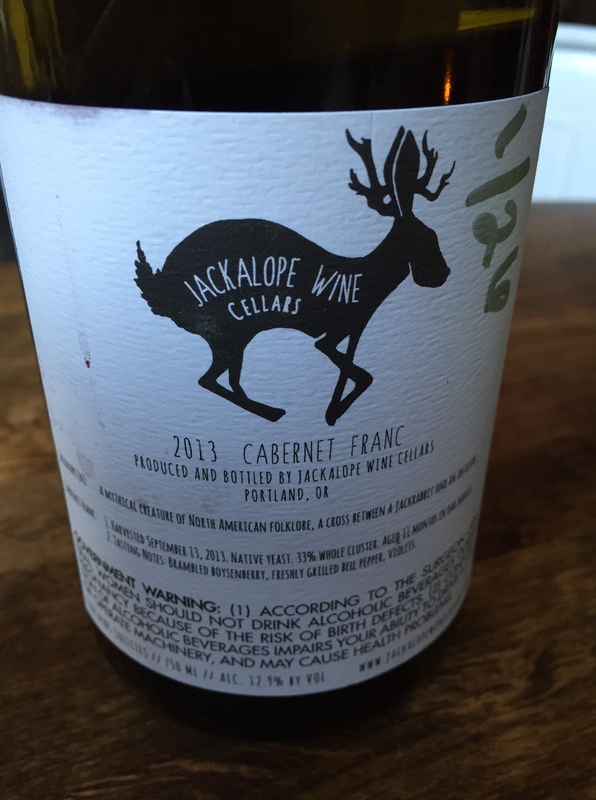 Did you know Cab Franc grows in Southern Oregon? I didn’t, before I moved here. Its sort of fun to look back on this blog project and realize that a few of my favorite finds of the month were actually from Southern Oregon. I didn’t see that coming at all, and its a really cool discovery. Filed under: Fonts I like. Cabernet Franc is a fascinating grape; it can be in the “fresh, red fruit” category and it can also be in the “deep dark tannic monster” category. This one leaned towards the former; it had some nice dark fruit coursing through its veins, but the warm raspberry definitely showed through. A hint of blackberry preserves and coffee bean, and some young, green leafy business going on, along with peppercorn and bay leaves. Really a cool wine that has a lot of different elements at work, without seeming disjointed. Fun to drink. According to the website, less than 70 cases made. A touch of whimsy on the label art tickles my fancy. There’s a cool story here. I’ll paraphrase, as you can surely Google if you’re so inclined. 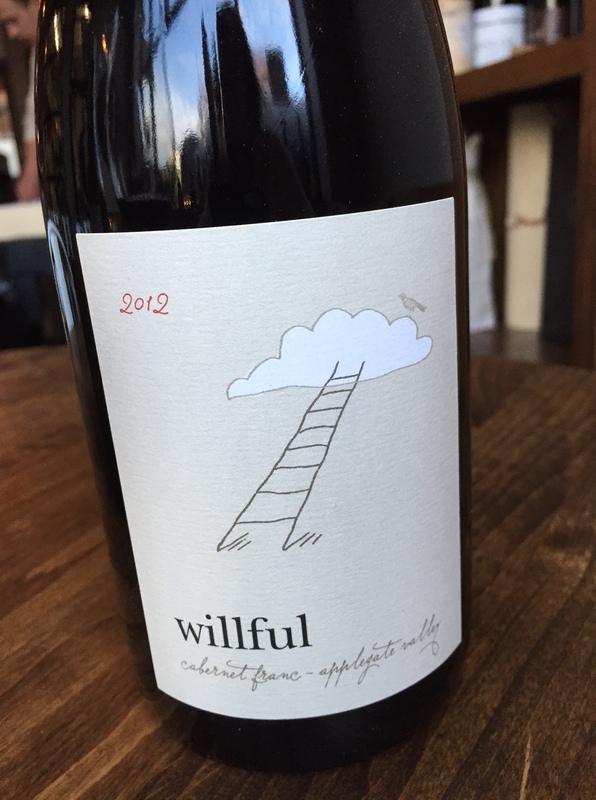 Willful Wine Company was born in 2012, and produces Pinot Noir from their estate in Dundee (I also tried this- great), and small quantities of other Northwest varietals. The owner and winemaker’s name is Pam Walden, and there’s some background here involving Daedalus Cellars/Jezebel wines. I don’t feel like I can do the full story justice without sounding like an idiot, but in any case- if this is only the second year that Pam has released wine under the Willful label- the woman can make some damn wine. I’m sold. This juice is fantastic. Actually, I’ll go out on a limb and say this might be my favorite new discovery of this 30 days. This is a big ol’ wine, with full flavors of black cherry and raspberry jam, followed by a high “ding” of sour cherry. Its oak profile is round and integrated; its a curvy wine but incredibly balanced. The finish is long and creamy with baking spices, pepper and subtle vanilla. Theres a nice play of savory/gamey/wildness (all technical terms) but not so much as to drown out the fruit. Its fleshed out nicely, yet not in my opinion overworked. Is that enough praise? I like the wine. Go get it. I also tried the SE Wine Collective Red Blend- a blend of Syrah, Pinot Noir, Gamay & Cab Franc- it was in keg form, so no photo- but it was a super fun wine! Buoyant, fresh, tart, pomegranate-y and a really great keg wine for all those reasons. I did a sort of “create your own flight” deal with these wines, and just put together the three tastes individually; they were $4, $5 and $3 each, respectively. Bottles are available for purchase too, for dine-in and take home. The SE Collective also has some pre-determined flights on the menu- the couple who were seated near me were sipping on the Chenin Blanc flight- three from around the world. The place is a fun concept and reminds me a lot of Cellar on Greene, except wine is being made there, which makes it that much cooler. Ridic is a good thing, by the way. 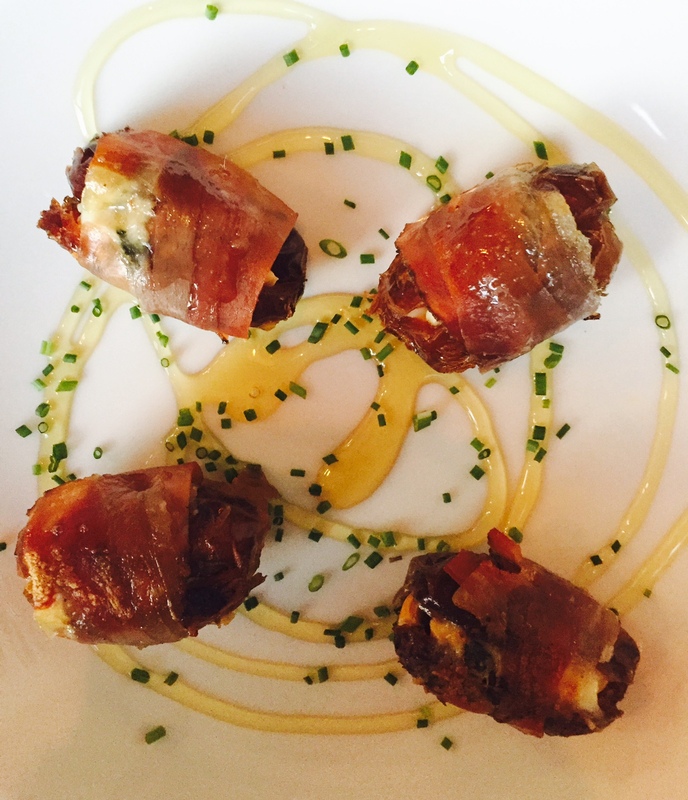 These dates were stuffed with gorgonzola & hazelnuts and wrapped in prosciutto, seared, and drizzled with honey. Freakin’ delicious. You’d think I was being paid to say these things, but really I’m not. I just like the place. You should check it out. Cheers, and thanks to the Collective for making it so easy to try two Oregon Cab Francs in one place! Score. ← Thirty Oregon Wines in Thirty Days, day 26: Belle Oiseau! Belle Waz-what?